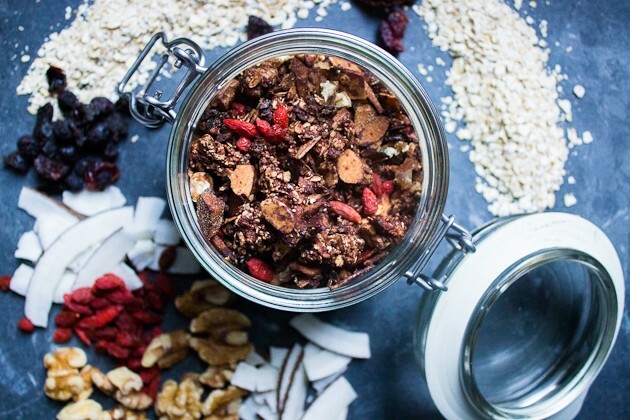 Healthy Vegan Granola Recipes | Simple Vegan Granola Recipe: Granola / crunchy muesli is probably the least, even if there are always enough ingredients in the area around and these can also be varied very well according to your mood. 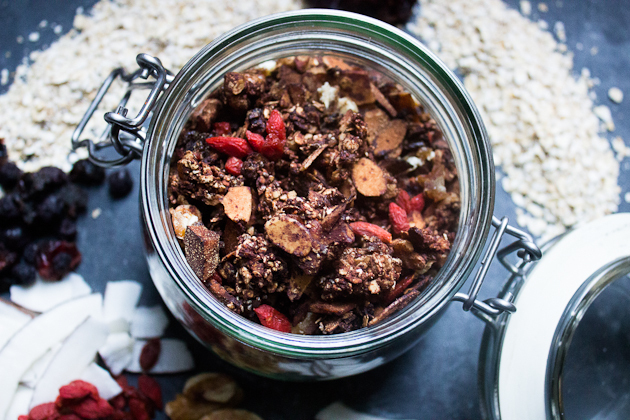 That's why today there is a recipe for one of my favorite variations of Granola as a suggestion for you with different nuts, seeds, dried berries, and chocolate. Incidentally, the recipe is also super easy and quick to prepare and you just have to mix all the ingredients once, before the stove does the rest for you. 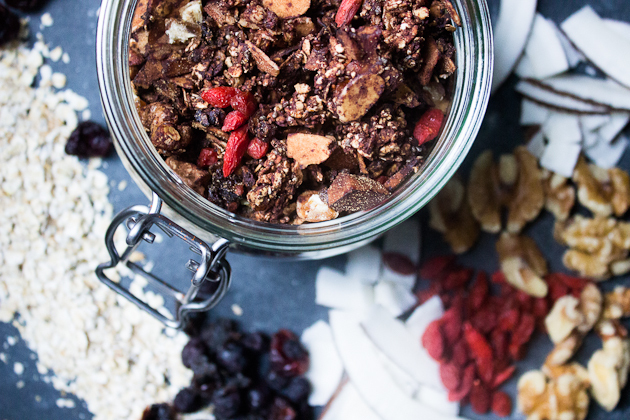 Enough reasons to make yourself a delicious granola, right? 20 g Coconut Chips, Roughly Chopped. 2 Tablespoons Of Flax Seeds. 1 Tablespoon Of Chia Seeds. 3 Heaped Teaspoons Of Cocoa Powder. 2 Heaped EL Puffed Amaranth. 4 Tablespoons Of Agave Syrup. 2 Tablespoons Dried Wild Berries, Chopped. Optional: Coconut Blossom Sugar To Sweeten. Mix oatmeal, walnut, coconut chips, almonds, flax-seed, chia seeds, cocoa powder, puffed amaranth, coconut oil and agave syrup well together. Spread the mixture evenly on a baking sheet and bake for 15-20 minutes. In between, be sure to stir one or two times through the crowd and at the end take good care that nothing burns. The path from crispy to burnt is, unfortunately, a very short one. Leave it to cool down and then add the dry fruit in it. If you want, you can also add some bittersweet chocolate chips to the mixture. The recipe for the cereal is specially written so that you do not have a very sweet end result, especially since herbal milk drinks and soy yogurt so often come sweetened. Therefore, you can just add so much coconut sugar or other chopped dry fruits until it is sweet enough.